Deeply Undervalued wins the Commonwealth Derby. Photo by Jim McCue, Maryland Jockey Club. Deeply Undervalued boosted his stock in the 3-year-old turf division Saturday at Laurel Park, rallying with a strong stretch run to capture the $200,000 Commonwealth Derby (G2). 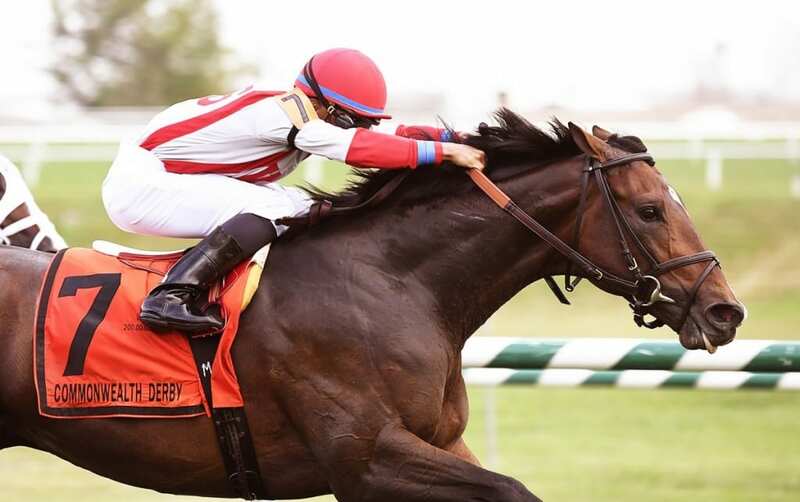 The Chad Brown-trained colt, who had won one of five previous starts, prevailed by a length while making his stakes debut in the 1 1/8-mile turf race presented by the Virginia Equine Alliance at Laurel Park. Ridden by Manuel Franco, the son of Kitten’s Joy settled off the early pace set by Franklin Towers and stalked by He’ll Pay before making a three-wide sweep around the far turn. Turning for home, the 6-1 fourth betting choice was taken five wide for the stretch drive and the Kentucky-bred colt responded with a strong kick to the finish. Isotherm, the 3-1 second choice, finished second following a wide stalking trip under Feargal Lynch, a head in front of 19-1 longshot He’ll Pay and jockey Gabriel Saez. American Patriot, the 8-5 favorite ridden by Trevor McCarthy, finished another nose back in fourth. Deeply Undervalued ran 1 1/8 miles over a firm ‘Dahlia’ turf course in 1:46.63. Deeply Undervalued ran once last year before returning in the spring with a pair of second-place finishes. He graduated by 3 ¼ lengths at Saratoga July 30, before losing a photo finish in an entry-level allowance to Revved Up, who finished a troubled fifth in the Commonwealth Derby. Owned by Klaravich Stables and William Lawrence, the stretch-running colt was saddled by assistant trainer Dermot Magner. “He hasn’t raced a lot of times. He doesn’t have that much experience. He has a bright future. He has a lot of options,” Magner said.